Jared Kushner loved Michael Moore’s health care crisis documentary Sicko. He loved it so much that he threw an after-party for it following the film’s premiere in 2007. The future son-in-law of and senior adviser to the future president effusively praised Moore to a reporter, singling out the filmmaker’s ability to construct a compelling argument and bring important issues in American life to light. The thing is, Kushner was right. Moore argues for his left-leaning political views passionately and forcefully, often building his case by mixing damning archival footage and expert interviews with his own goofy antics and sly commentary. The effect is something of a gale force, sweeping you along and compelling you to nod your head, without a lot of time to wonder what’s been left off the screen. It’s effective, and Moore’s sources as embedded in his narrative are generally reliable. But it can feel loose and free-associative in some ways, and Moore’s injection of his own persona into his films — especially the smug snark of his commentary and the affected cluelessness he uses as an interview technique — can get old very quickly. So his films are by turns convincing and infuriating, and more recent offerings have inspired tepid reviews even from critics who share his political views. His 2017 one-man Broadway show, The Terms of My Surrender, leaned into the worst of these tendencies and garnered flat-out bad reviews, in a city where his political leanings might be assumed to be shared by most of the audience. With Moore, mileage greatly varies. In particular, self-mythologizing has always been his Achilles heel, so there was a great deal of eye-rolling among critics in June, when the title of his next project was announced to be Fahrenheit 11/9 — a reference to his 2004 documentary Fahrenheit 9/11, which criticized the George W. Bush administration and the War on Terror. That film won the Palme d’Or at Cannes and became the highest-grossing documentary of all time. Was Moore really about to draw a comparison between the events of 9/11/2001 and 11/9/2016 — the day after Donald Trump was elected America’s next president? He was. But the film is much better than the baggage that comes with its title might imply. Moore still suffers from bouts of self-aggrandizement and snide generalization. But they feel jarringly out of place, and in a good way. That’s because, for a great deal of the film, Moore cedes the floor to people whose voices are not as easily heard, or who have had to fight to have a voice at all. Fahrenheit 11/9 is a sweeping broadside against Trump, to be sure — not an original approach in documentary filmmaking these days. But it also does what few political films seem willing to do in the Trump era: It powerfully (if unsystematically) dismantles idealistic notions about how much better things were before Trump took office. The film’s news peg may be the current administration, but its target is self-satisfied liberals who more or less trust the system. Early on, Moore even implicates himself, offering up a series of mea culpas for people he’s hobnobbed with in the past — Kushner, Steve Bannon, Kellyanne Conway, and Trump himself (on Roseanne Barr’s talk show, no less). Moore sprays water from Flint, Michigan, on Gov. Rick Snyder’s mansion in his new documentary Fahrenheit 11/9. Moore goes after everyone close to the president, even insinuating early on that there is something very inappropriate about his relationship with his daughter Ivanka. He even winds up not just comparing Trump to Hitler, but layering one of Trump’s speeches atop video of one of Hitler’s. But he reserves his most angry, pointed, and well-constructed criticisms for what he paints as a toothless, crony-driven Democratic establishment and — in a turn that might surprise some viewers — Barack Obama, and particularly Obama’s visit to Flint, Michigan, in 2016. 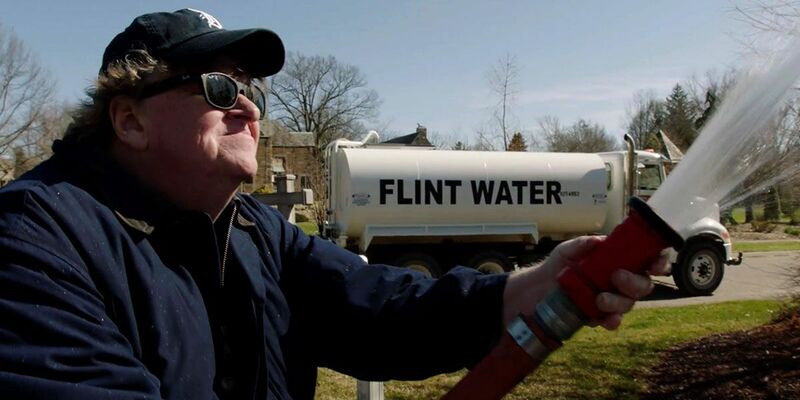 At the Fahrenheit 11/9’s Toronto premiere, there were audible gasps in the theater many times, but perhaps the loudest one came when the film detailed how Snyder ordered that the water supply for Flint’s General Motors factory be switched back to clean water because it was corroding auto parts — while leaving the population with a contaminated supply that the government continued to insist was totally fine to drink, despite overwhelming evidence to the contrary. The Flint section of the film is infuriating but also illuminating; Moore lets whistleblowers, doctors, residents, and local law enforcement vent their anger while also drawing a line between Snyder and Trump that is, at minimum, disturbing. If democracy worked in America, he suggests — if people really felt that their vote meant something — then perhaps the nation could travel down a path that would lead somewhere positive. Moore dutifully attacks the idiosyncrasies of the system, like the Electoral College and the Democratic Party’s system of superdelegates. But he seems pretty sure that it’s actually activism from the bottom up that will change the country. And so in addition to his own activism in Flint, he spotlights the Parkland, Florida, teens and the March for Our Lives movement and the teachers’ strikes that began in West Virginia and spread to other states. Is he right? It’s too early to tell. After infusing a solid stretch of Fahrenheit 11/9 with hope, clearly seeking to inspire the audience to actually believe things can change, Moore returns to a more somber tone. He reminds viewers of the apparently enlightened and free-thinking historical context into which Adolf Hitler stepped, less than a century ago, and his thesis is clear: It — meaning the dehumanization of large groups of citizens and devotion to a charismatic strongman leader — can happen here, and it may already have happened. As a film, Fahrenheit 11/9 is flawed. The movie feels at times more like a crash course in what’s happened since 2016, a kind of “worst hits” album desperate to hit every possible point and draw them all into a unifying theory. That’s all crammed into about two hours, and the whiplash is considerable. It’s possible that Moore was trying to mimic the chaos of the news cycle over the past couple of years, but much of the film doesn’t stick so much as leave you with a lot of feelings. At times, it seems as though some important issues have been wrapped into an argument against Trump because Moore isn’t sure people would have cared otherwise. (Whether or not he’s right, I can’t say.) I especially found myself wishing that, given Moore’s stature among socially conscious audiences as well as his personal connection to Flint, that he had spent less time writing clever zingers about the president and instead made an entire feature film about Flint alone, digging more deeply into its problems and their potential solutions. 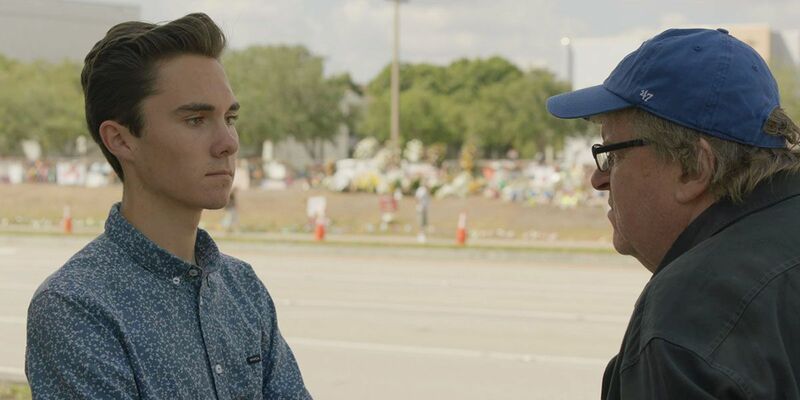 Michael Moore speaks with Parkland teenager David Hogg in Fahrenheit 11/9. Still, whenever he steps out of the way and hands over the microphone to those without household name recognition, Moore is an effective filmmaker. He knows who to talk to, and he doesn’t focus only on the big names. Voters and public school teachers in West Virginia; an Iraq war vet and various left-wing candidates running for Congress (including Alexandria Ocasio-Cortez and Rashida Tlaib); the last living Nuremberg prosecutor; whistleblowers and doctors and parents and residents in Flint; and many more individuals who don’t grab headlines quite as easily as Trump are all part of Fahrenheit 11/9. With their aid, Moore weaves a tapestry not of hope, but optimistic outrage. Fahrenheit 11/9 is not going to convince any Trump loyalists to reconsider. But it has no interest in doing that. #NeverTrump conservatives aren’t likely to watch the film either, even though it may offer them some surprising common ground, despite the fact that Moore’s critique of the Democratic Party comes from his democratic socialist views. Instead, the film concentrates on not letting its more natural audience off easy. It criticizes the easy generalizations, ahistoricity, and even tribalism of a liberal audience (the critiques of Obama and of Clinton, in particular, don’t hold anything back). It suggests the country is a wreck not because of those other people out there, but because the people in the theater itself aren’t even committed enough to their own ideals to get uncomfortable and do something — unlike, for instance, the West Virginia teachers who stayed on strike after their union leaders came to a compromise they wouldn’t accept, or the teenagers who organized the March for Our Lives. 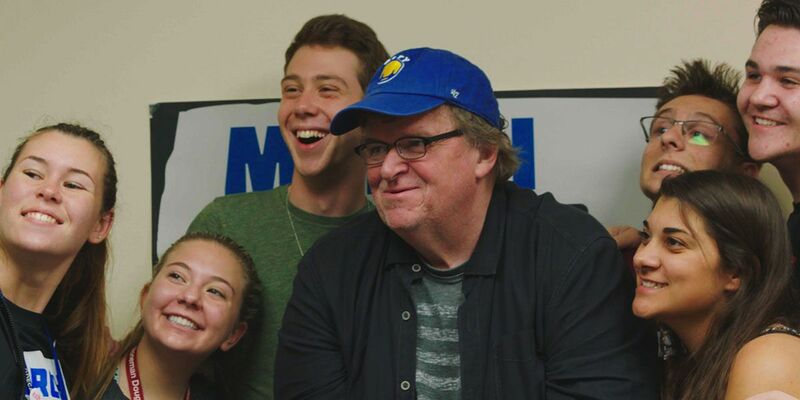 Moore with a group of teens who organized the “March for Our Lives” in Parkland, Florida. That means there’s something in this film to irritate everyone. And it’s certainly true that a more focused approach may have ultimately been more effective at dismantling his opponents. After all, everything Moore says has been out there, publicly reported by “the media” for years, and it’s the barrage of information that has sent a lot of people into a spiral of apathy, overwhelmed by everything that needs doing and everything that is awful. Do we need more outrage in 2018? Moore thinks America does need more outrage — but more focused outrage. It’s useless to hate on Trump, he posits. What we need to do is to “get rid of the whole rotten system that gave us Trump,” as he declares toward the end of Fahrenheit 11/9. And that effort, to him, will start with the “real” America, the people to whom he’s increasingly handing the microphone. Fahrenheit 11/9 premiered at the Toronto International Film Festival in September and opens in theaters on September 21.